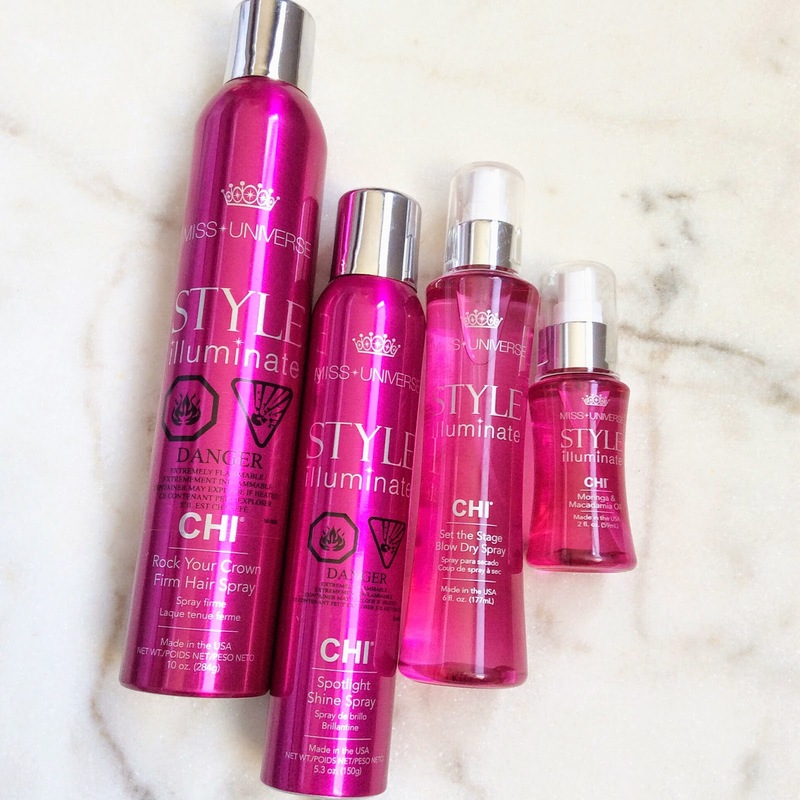 CHI, the brand who brought us the flat iron and the ceramic compound, has just released Miss Universe Style Illuminate, a new glam hairstyle collection. While I can't say that I am the biggest user of hair styling products - I pretty much have a free-spirited approach to hair care much like the French women - I'm always in when it's time to try new beauty products. Initially created to help the Miss Universe contestants, who need to style their hair many different ways every single day during the course of a pageant, the line is also meant to be quite user friendly even for non-professionals. The main idea behind this line is flexibility in the sense that these products were developed to take you from day to night and allow you to create more than one style in one day. The key ingredients found in this new line are Moringa and Macadamia oils, both rich in vitamins and antioxidants to help nourish, add shine and protect hair against heat damage. I have tried four different products from the line, the first one being Set The Stage Blow Dry Spray. I have used a few pumps of this heat protection spray before blow-drying my hair. Now, although I don't own the most sophisticated hair dryer, I have been surprised to see how fast my hair tend to dry whenever I used this product. The second product I have tried is the Spotlight Shine Spray. It's basically a spray that adds shine while taming flyaways. The result is instantaneous and very natural. Interestingly enough, this product is also used on beauty pageant to add shine to the legs before a swimsuit competition. The third product I have tried is the Rock Your Crown Firm Hair Spray. This is a maximum hold hair spray that also adds shine. I love how it gives firm control without adding stiffness. The Moringa & Macadamia Oil is the fourth product I have tried from the range. I might be quite biased to this oil because I am currently having a massive crush on face and hair oils. Like many other similar oils, this new one can be applied as a finishing cream, as a hair treatment to nourish hair and to protect hair from UV rays. The particularity of this oil is its gorgeous fragrance. In fact, the entire line has the same addictive smell that just puts you in such a good mood. To add to that, the four products I have tried don't seem to create much excess buildup, which is usually what I dislike about hairstyling products in general. I hope this will inspire you to try new hairdos for spring. Let me know what you think of this line! 6 comments on "Beauty Queen Hair With CHI"